"Gina is a maestro of public speaking! She coached me for my TED talk, and I am forever grateful to her for giving me the technical and emotional training I needed to take the stage." "Gina is an incredible coach who'll increase your impact when presenting in an executive setting-or any professional interaction. But she can't be everywhere, so this book is the next best thing! A must-read." Every body tells a story. From the moment an actor steps on stage, an audience collectively feels whether his or her performance is authentic, forced, or over the top. Business professionals are also performers-and the workplace is their stage. 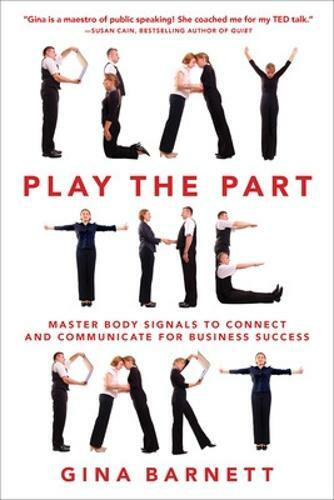 In Play the Part, executive communication consultant Gina Barnett brings the same techniques actors use to bear on all types of presentation and communication situations, from the board room to the conference stage. She reveals how the body affects our communication and thought patterns and how to align these consistently for maximum success. Featuring practical exercises, she shows you how to develop presence and become more intuitive, so you can navigate challenging communication situations with optimal results. You worked hard to earn your title. Now it's time to play the part.